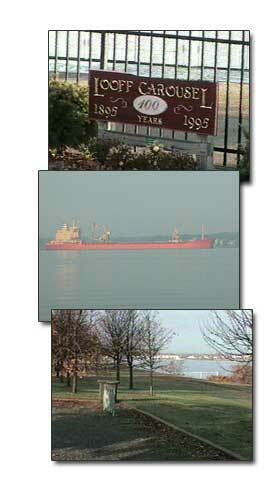 Crescent Park is in East Providence, RI which is considered Riverside, RI. It is one of our favorite places to lay in the sun because few people visit here. If you can make your way down to the beach it is a great place for beachcombing of old sea glass. There is no swimming here even though they have taken steps to clean up the water. In the early 1900's it was a real popular place to swim. They even had a pier and beach houses. There are a lot of people who fish here now. On our last visit to Crescent Park, we noticed they are totally renovating it again. There used to be an amusement park to the East of the grounds that you see in the bottom picture, but they built condos where the park was. The only thing left now is the Looff Carousel, built in 1895. Unfortunately is was off season the last time we were there, so it was closed. But now that it's summer, for 75 cents, you can still catch the brass rings and toss them into the clown's mouth as you swirl around on the beautifully carved wooden horses. If you get the gold ring don't toss it because you'll get a free ride. Lots of fun for the young and young at heart. It really makes you wish the Riverside Amusement Park was still there for all to enjoy. Take Interstate 95 to Providence, take Interstate 195 south, Exit the Taunton 44/Riverside exit 4 and keep to the right. Follow it all the way till you see the carousel on the left. The parking lot is just past the carousel on the right. If you are heading to East Providence, you may want to check out a museum. Here's an email we received. "Hi, I'd like to recommend the Cape Verdean Museum in East Providence, RI for the Rhode Island attractions section of your site. It is a small museum and Cape Verdean culture is definitely one of those things outsiders know very little about." The Cape Verdean Museum has a unique collection of artifacts, photographs, maps and crafts the tell the story of the islands and their people. It has also a great deal of information on Cape Verdean Americans and their history. There are exhibits on slavery, whaling, Cape Cod cranberry picking, the immigration packets, the longshoremen, the Independence movement among other topics.